KARACHI: The ongoing tussle between the Pakistan People’s Party (PPP) and Pakistan Tehreek-e-Insaf (PTI) pertaining to the venue for their May 12 rallies has come to an end after PPP Chairman Bilawal Bhutto Zardari offered the PTI to go ahead with the rally in response to PTI’s conditional offer. The two parties have been at loggerheads after both parties announced holding a public gathering at Hakeem Saeed Ground in Karachi’s Gulshan-e-Iqbal area. However, things begin to warm up when the top leadership of the PTI, after an earlier meeting in the day, reportedly said that they were willing to relocate their scheduled rally from the Hakeem Saeed Groud if the PPP was willing to do the same. Subsequently, Bilawal tweeted that the PPP would relocate its rally for the sake of peace in Karachi which it has “fought so hard” for. “PTI has shown such an appalling attitude. However, in the interest of peace in Karachi, which we have fought so hard for, I not only ask my party to find another location, but also invite @ImranKhanPTI to hold his jalsa at Hakeem Saeed ground,” said the PPP chairman in a tweet. 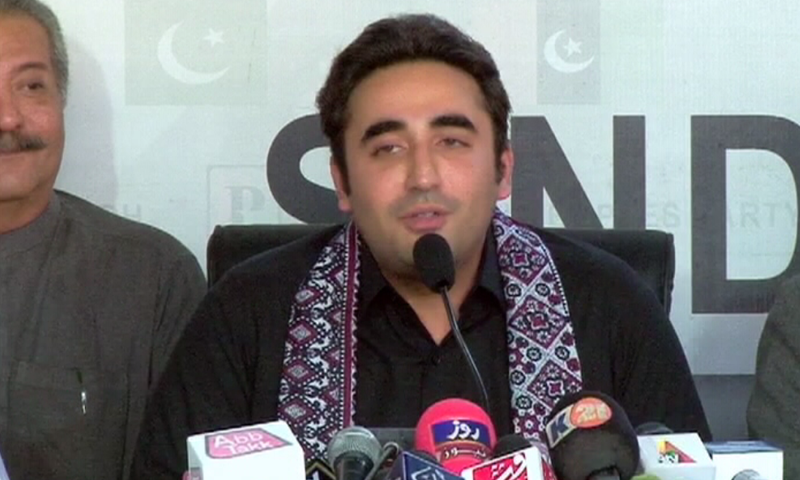 Bilawal stressed that he would call for a complete inquiry and hold all those responsible accountable for their actions. Earlier in the day, the top leadership of the PTI said they would relocate their scheduled rally for only if PPP announced a new venue for its rally. The announcement came following a meeting of the party’s top leadership a day after several were injured in the violent clashes between workers of both parties. “If PPP decides to hold their rally at a different venue then we will also change the location of our rally from Hakeem Saeed Ground,” PTI’s Firdous Shamim Naqvi said. Earlier, PTI Chairman Imran Khan said that use of violence by PPP in Karachi on Monday night reflected its fear of the PTI’s popularity in Sindh. PPP Secretary General Syed Nayyar Bukhari also issued a statement, blaming PTI for the violent clashes, adding that the PTI leaders consider the law beneath them. Bukhari also accused PTI of wanting to disrupt the law and order situation, stating that Imran was promoting extremism in the society. Moreover, two policemen were also arrested for aerial firing during the PPP-PTI clash on Monday night. The arrests were made following the confirmation of the initial police report owing to a video of the incident, which went viral on Tuesday. In the video footage, constables Nadeem and Arif can be seen firing aerial shots. According to the police report, the two policemen were a part of PTI leader Ali Zaidi’s security detail. Zaidi later confirmed that his police guards had engaged in aerial firing, however, he said it was done to protect him from the enraged mob. Separately, a case was lodged against the workers of PTI and PPP, who resorted to violence in Karachi. As many as 700 PPP and PTI workers were named in the case that includes clauses of riots and acts of vandalism. On Monday, a violent clash erupted between workers of PTI and PPP at Gulshan Iqbal area where members of both rival political fronts threw stones at each other and tore banners. According to inputs, both parties’ workers resorted to violence over a venue dispute for May 12 rallies announced by both the parties in Karachi. The incident was first reported when a number of PPP workers set ablaze a camp of the PTI workers.